“This 3-piece set is oven safe to 500 degrees and dishwasher safe." Like Le Creuset, Emile Henry is a highly-regarded cookware brand, with a price tag to match. This ceramic casserole dish is made in France of Emile Henry’s proprietary clay technology. Thanks to that it is safe in the oven up to 520 degrees Fahrenheit, and can be used under the broiler unlike the Le Creuset dish. The interior glaze resists staining and scratching, and is dishwasher safe—making cleanup a breeze. The sturdy glaze also makes cutting into casseroles and lasagnas with metal utensils no big deal. The angled handles also make it easy to remove this dish from the oven, but make sure you have a good grip on them if you’re wearing oven mitts. Available in five colors—leaves yellow, rouge red, spring green, sugar white, and twilight blue—it can go from oven to table without any problem. Of course, this one doesn’t have a lid, so it will need a layer of foil if you want to travel with it. It also comes with a 10-year warranty. Take a peek at some of the other best ceramic cookware sets you can buy online. The price is right on this 2-quart casserole dish, but it has several features that rival more expensive models. Like some high-end dishes, it's constructed of nonporous glass that won't scratch, fall apart, or absorb odors. Glass is also great because you can use it in the oven, microwave, fridge, freezer, or dishwasher without worry. The wide handles make this easy to hold onto, even when you’re wearing bulky oven mitts, and they add a little more flair to your presentation when it’s on the table. This Pyrex dish also includes a lid with a top handle that you can use during (and after) cooking. With all of these handy features, you'll definitely use this dish regularly. Two round casserole dishes plus a lid make this set perfect for all of your cooking needs! There is one 1 1/2-quart casserole and one 2-quart casserole, so you can cook everything from macaroni and cheese to chicken and rice. Rather than having prominent side handles, the flared sides widen on either end to create handles that make for a prettier presentation on the table. Got leftovers? You can easily store them in the refrigerator or freezer. When it comes time to cook or reheat, they're oven safe to 500 degrees and microwave safe. Reviewers say they are beautiful pieces and the lid has a large loop handle that’s easy to grasp (even when wearing oven mitts). They’re dishwasher safe for easy cleaning when all the food is gone, but users have commented that they are easy to clean by hand as well. 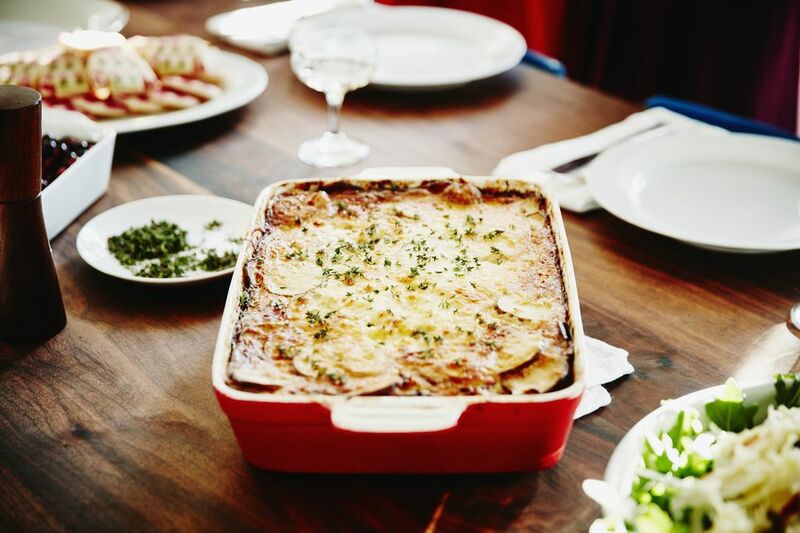 If you’re looking for a basic casserole dish that will look sleek while putting the focus on the yummy food you’re serving up, a glass one is a great choice. And you can’t go wrong with the classic Pyrex brand, a staple in many homes for generations. This dish holds three quarts and measures 9 x 13 inches. It’s safe for the oven, microwave, refrigerator, and dishwasher. The baking dish has a non-porous surface which means it won’t absorb food odors, flavors, or stains. And it comes with a red plastic lid which is BPA free, however, keep in mind the lid is not safe for the oven. Customers love the quality of the product saying it works well with food. They also love the fair price and simplicity of the dish. Some had issues with the lid not fitting well, so if you’re buying it just for that, you might want to consider another product. But if you’re in the market for a classic baking dish that won’t cost a lot of money, this one comes highly recommended. When it comes to casserole dishes, there are the traditional shapes that we’re all familiar with, and then there are more unique shapes—like this one that breaks the mold just enough to give it some personality. Made from sturdy stoneware with slightly flared sides, this is great for cooking, but it will also make a statement when you’re serving. Even if you don’t use it for cooking, you’ll love it for serving mashed potatoes, vegetables, or stews. This holds just over 2 1/2 quarts, so it’s large enough for family gatherings, and it can be used in the oven, microwave, dishwasher, refrigerator, and freezer. If you love the look of matching sets, you can find a wide variety of other Mason Cash stoneware to match this casserole dish. This casserole dish looks stylish, and it does one thing that standard ceramic or glass casseroles can’t do—you can use this on the stovetop, even on a direct flame. It’s heat resistant to 752 degrees, so you can use it at the highest heat in your home oven, or even in your high-heat pizza oven. It’s also safe on your barbecue grill, halogen cooktop, or in your microwave, so you’ll be reaching for this one over and over for baking braising, searing, sautéing, and frying. This has a zero-crack glaze and is shock resistant and scratch resistant. Cleaning is easy, since it’s dishwasher safe. When cooking is done, you can store this in the refrigerator or freezer. Neoflam casseroles are available in several different sizes and colors, so you might want to pick up extras for cooking and serving. This casserole holds 2 quarts. Potlucks can be a lot of fun, but there’s always that awkward moment when it’s time to pack up leftovers. If you want to give the leftovers to the host, they need to find a container to hold them or you’ll need to leave your casserole dish behind and then find time to retrieve it. If there are no leftovers, you need to bring a dirty dish home to be washed, and who wants to deal with that after a party? This clever carrier and pan solves your problem! Simply cook your food in the included foil baking pan (it's disposable), and then place the pan into the Fancy Panz Casserole Carrier. Use the included lid to keep your food hot until it's serving time—just be sure to cool hot foods to 200 degrees before placing them in the casserole carrier. When the party is over you can leave the foil pan behind, dispose of it if it’s empty, or bring it back home in the carrier. Each Fancy Panz comes with a removable riser, foil baking pan, plastic spoon, and clear lid. The plastic riser is BPA free and top-rack dishwasher safe. They come in a variety of colors, and they can neatly stack on top of each other. It should be no surprise that Le Creuset snagged one of the top spots on our list. Known for their enameled Dutch ovens, they are also leaders in baking dishes as well. The stoneware construction of this dish helps it cook evenly and prevents any hot spots from scorching your food. It also makes it useable for most oven temperatures, and safe to use in the freezer, microwave, and dishwasher. Just don’t use it under the broiler or on an open flame. The glazed interior is virtually nonstick, so even if you decide to hand wash it, it won’t be difficult to clean. And the ridged handles make it easy to grip when removing it from the oven—even when wearing oven mitts. It comes in eight colors including Caribbean, white, cherry red, flame, hibiscus, Marseille, palm, and soleil, so you’ll be sure to find one that fits the rest of your kitchen’s décor. Plus, the lid makes it ideal for transporting dishes to potlucks or family dinners. Keep in mind that Le Creuset is on the pricey end of the spectrum, so if you’re looking for a budget option this might not be your best bet. When you think of a casserole dish, you might think about ceramic, but cast iron works surprisingly well too. This covered casserole holds 3.6-quarts and has a double-layered porcelain enamel surface that is chip resistant, never needs seasoning, and is easy to clean. The cast iron has superior heat retention, so your au gratins will stay warm all through dinner. The lid fits tightly, to retain heat and moisture during cooking or for serving. Since it’s made from cast iron, you can use this on the stove or in the oven, then take it straight to the table. It’s also refrigerator and freezer safe and can be used on any cooktop (including induction), but it’s not recommended for use on outdoor grills or open flames. The lid knob is safe to 500 degrees. This is dishwasher safe, but hand washing is recommended. It's available in red or blue. Sometimes the best casserole is one that you don’t need to share. This oval casserole is perfect for individual servings of side dishes or pot pies, or use it for sauces, dips, or snacks. The casseroles are made from durable ceramic and are oven safe to 500 degrees. They are also microwave safe, so it’s easy to reheat leftovers, and they’re dishwasher safe for easy cleaning. These come in a variety of colors to mix or match with dishes or serving pieces or choose colors to fit a holiday. They hold 17 ounces each, and are sold individually.